A cold front entered Arkansas during the afternoon hours of March 15th. Numerous severe storms developed across the NW 1/2 of Arkansas early in the period. However, these storms were located behind the boundary and were quite elevated in nature. Jason Politte, Derek Deroche, and I targeted Central AR near the surface low. Finally, one surface based storm developed along the low which tracked ENE through Central Arkansas. The storm presented excellent structure features including a nice flanking line, mammatus, and a hard updraft. Severe warnings were in place for over two hours before the cell finally died around Little Rock, AR. FULL ACCOUNT AVAILABLE. Jason Politte and I targeted Jonesboro, AR and departed LIT around 10:30am. The cap finally gave around 3pm and the chase began. Towers quickly developed across NE AR about 25 miles to our west. At 4pm, a severe storm was warned for Craighead County. Near Cash, AR, the storm became well organized and contained a nice wall cloud. The sustained wall cloud exhibited excellent rotation. A nice vault was present and clear signs of an RFD punched in on the south side. The wall cloud continued good rotation and rapid upward motion. A funnel cloud eventually formed but the region became quickly rain wrapped and the contrast became poor. A tornado warning was issued shortly after. Jason Politte and I departed TXK around 8:30am and made a quick data stop in Tyler, TX. We noticed some surface heating taking place with the dry slot ahead of the low west of DFW. With this in mind, we decided to target Hillsboro to Meridian. West of Corsicana, we noticed some explosive towers to the south developing near Marlin, which we targeted the cell and headed towards I-45. At 1:18pm, a tornado warning was issued for Limestone County near Thornton. At 1:40pm south of Streetman, we observed an inflow tail trailing into the updraft near Personville. A well-developed forward flank shelf was visible to our west as we entered the vault region near Fairfield and encountered intense CG activity. Arriving in Fairfield at 2pm, we took Highway 84 east as the supercell was approaching the town. We were clearly able to observe the meso from Highway 84 as it moved over Fairfield. Rapid rotation was noticeable as a strong RFD was wrapping precip around the meso. 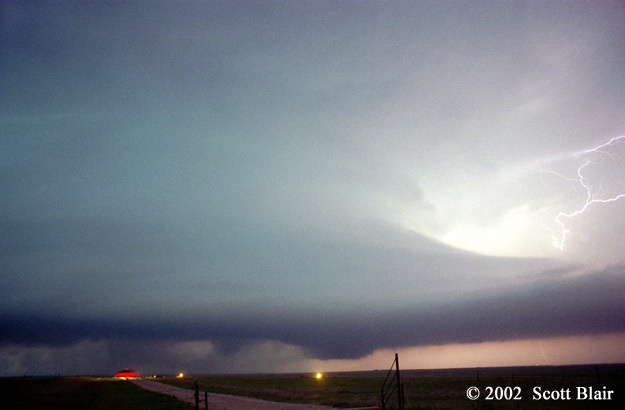 Hearing reports of tornadoes near our original target, we attempted to intercept the cells. However, by the time we arrived at the cell near Cleburne, it was clearly linear in nature. We ended the chase day observing a turbulent shelf with some excellent color with the setting sun. Jason Politte and I met up with Eric Nguyen and targeted areas of Western Texas. Convection fired along a dryline. We observed a nice supercell with similar LP characteristics. We attempted to verify hail size several times but failed to observe anything larger than quarter size hail. The stones were filled with pockets of dust. 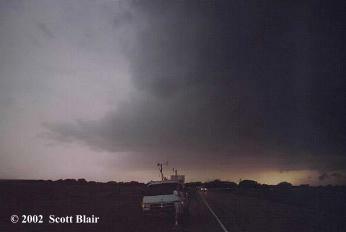 We later observed a classic example of a splitting supercell before both splits decayed. We ended the day watching a great sunset next to a weather station. 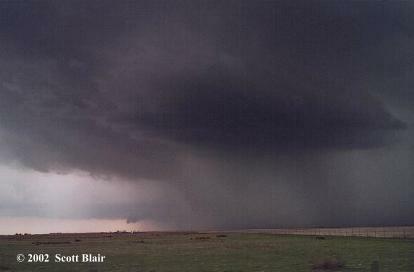 The 15th brought several gustnadoes with elevated storms across SW Kansas during the daytime. As night set, a classic supercell developed west of Pratt, KS. The storm was striated with a hard rotating meso. Hail up to 2.25 inches was observed north of Mullinville, KS. A distinct hail roar was noted as the storm passed north of Pratt, KS. Decent turbulence noted on the back-side of the meso associated with the RFD. 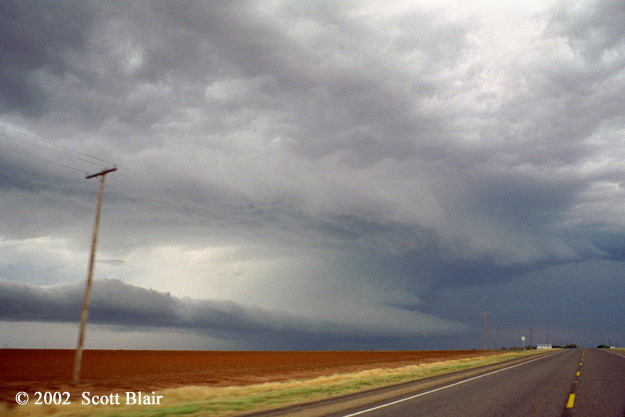 May 16th led us to CO, OK, and TX as two long-lived supercells developed. The first storm had decent rotation with the RFD rapidly rotating around the meso. We decided to target the southern storm in the Oklahoma Panhandle. 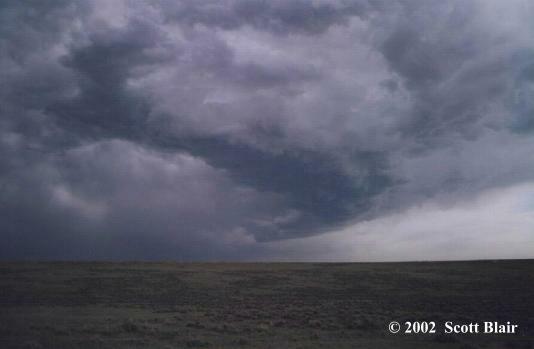 This supercell was much more organized with a nice meso and 50mph measured inflow winds. The storm was able to produce a weak tornado NW of Goodwell, OK across an open field. The day ended north of Gruver, TX as awesome structure was observed. Eric Nguyen, Jeff Gammons, Chris Colloura, Jason Foster and I targeted areas of Eastern Wyoming for an outside shot at severe weather. Indeed severe weather did develop, although quite weak and linear. Winds overall were intense with a 73mph gust recorded by a gustnado hitting us directly on. Muddy rain welcomed us as we ended the chase. Observed a nice HP supercell briefly before the updraft became rapidly undercut. Once this cell died, we observed several other cells. No future cells could ever maintain a significant updraft to even be classified as a supercell. No other interesting features were observed. FULL ACCOUNT AVAILABLE. Met up at some point off and on with Eric Nguyen, Scott Currens, Jeff Gammons, Chris Collora, Amos Magliocco, and Jason Foster. Entering the extreme NE Texas Panhandle near Follett, TX, an updraft exploded and the first supercell of the day was well underway. Blasting south on Hwy305, we pulled over on a side dirt road about 3 miles NNW of Lipscomb, TX. The cell continued to organize with a fair-sized core and developing wall cloud. Around 5:50pm, a well-formed dust whirl tornado touched down in the field next to our location. The multi-vortex circulation was a fairly intense and lasted for about three minutes. Around 8pm, new supercell near Spearman, RFD was clearly wrapping around and was close to occluding the wall cloud. The wall cloud developed a pointy shape and shortly after a tornado condensed downward. The tornado was nice as sheets of rain rotated around the wall cloud. The tornado lifted after about two minutes. High potential for supercells and tornadoes along an advancing dryline. Limited surface heating lowered potential for significant severe. Most storms in SW OK and NW TX were rain-wrapped and limited updraft strength. Tired of this, Eric Nguyen and I blasted south to a tornado-warned cell in NW TX. The cell showed excellent features before becoming outflow dominated. I ended the day in SPS. FULL ACCOUNT AVAILABLE.Memorial Day held its stormy reputation as long-lived supercells developed across West Texas. 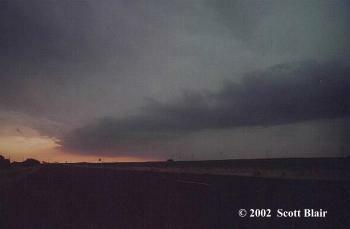 The first supercell developed near Tulia, TX. As the storm later showed signs of weakening, our attention was turned to another supercell near Abernathy. The storm was slow to organize but finally exploded near Cone, TX. An obvious RFD formed and the precip core expanded. We observed a weak, well-defined tornado NW of Ralls around 5:15pm. The meso really lowered with time and produced another tornado ESE of Ralls around 5:35pm. This tornado was multi-vortex in nature as numerous vortices danced underneath the meso for several minutes. South of Crosbyton, we encountered awesome hail that significantly damaged the windshield. The stones were 3 inches measured with numerous spikes. A third supercell was observed west of Spur, TX. A RFD punch and nice wall cloud developed. The storm was very close to a tornado but never did. The day ended with nice structure in Spur. Eric Nguyen, Scott Currens, and I chased into no-mans-land South Texas, well south of Midland, TX. A nice supercell developed slowly, but the lack of roads made for difficult close viewing. 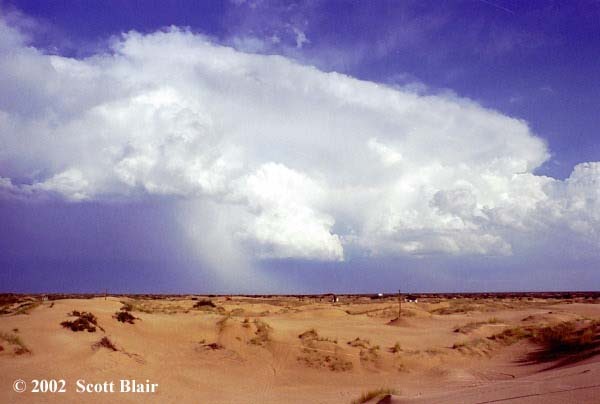 We let the storm pass and observed the cell with excellent foreground of sand dunes. We walked around on the dunes while shooting stills of the departing supercell. I completed a super drive from Midland to Little Rock non-stop through the night into the morning. Jason Politte, Chris Kridler, and I targeted areas of Eastern Colorado. A cell was briefly placed under a tornado warning, but clearly became outflow dominated. Flagler, CO brought an awesome downburst of quarter to golfball sized hail along with a beautiful shelf cloud mixed with dust. We continued to follow the cell on I-70 and observed several mesos rapidly develop. The mesos quickly became rain-wrapped thanks to the RFD. We ended the day in Dodge City, KS. 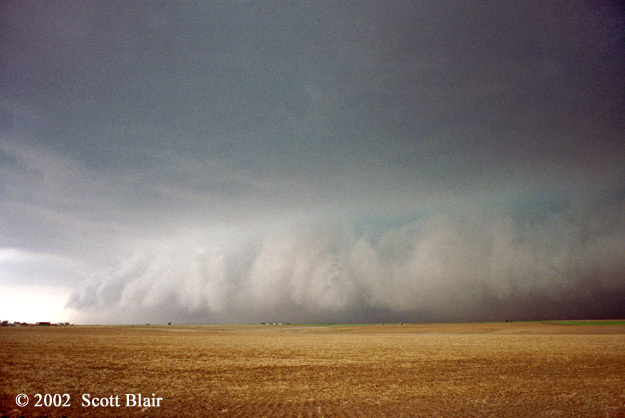 The following day led Jason Politte, Chris Kridler, and I to Lubbock where one supercell contained copious amounts of dust. The second supercell of the day developed near Floydada, with excellent structure and hail. The third supercell developed near Hwy82 and I intercepted another intense hail storm with the largest stones up to golfball. Terrible driving conditions existed NE of Dickens, TX as we ended the chase day. After intercepting Tropical Storm Isidore in South Louisiana, another intercept arose with Hurricane Lili. We first arrived in Abbeville, LA before shifting our intercept target to New Iberia, LA. Here we encountered sustained winds 80-95mph with a peak gust of 106mph. The lowest pressure recorded was 980mb, although more data checks will be completed soon. Video was great. We witnessed a considerable amount of damage to the New Iberia to Abbeville area, but luckliy no injuries were reported. A detailed summary will follow soon along with awesome pictures! 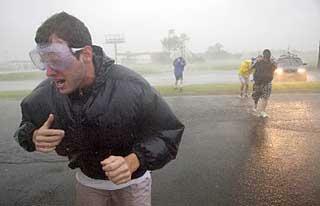 (Photo- Here I stand in 90mph winds along with others in New Iberia, LA. Copyright Dave Martin / Associated Press).